As I mentioned last week I was at a crossroads of choosing an army for the Facehammer GT at the end of September. I couldn't seem to settle one one thing or another and finally over the weekend after taking on the feedback I had from the article and chatting to friends in the hobby I've finally gone with my heart and settled by the constant temptation of doing a Host of Slaanesh. Having picked up the General's Handbook this weekend (review incoming), I've pawed through the points for the Slaanesh items and have decided to stick to a rather straight forward Slaanesh Daemon army. The option of adding Mortal Slaanesh to the mix was tempting but it was more using Slaves to Darkness and giving them mark of Slaanesh, the moment I started doing that the army began to swell without having any real substance to it. The list I've settled on comes in at 1980pts. It seems a lot of lists that I've seen in the past few days are always 20/40 points off the 2,000 mark but there's nothing I can do about that and I'm happy with my list so I'm not going to change it just for the sake of 20pts. I'll be using the Chaos Allegiance abilities and artifacts, though I've not settled on what ones I'll be taking for the event yet. So what's in my list? No Slaanesh list can be complete without the inclusion of a Keeper of Secrets. Unfortunately I'm not a fan of the current GW Keeper of Secrets model as it’s starting to show its age amongst all the current level of kits in the Age of Sigmar range; plus it's also Finecast so I'm always a bit sceptical when it comes to the quality. 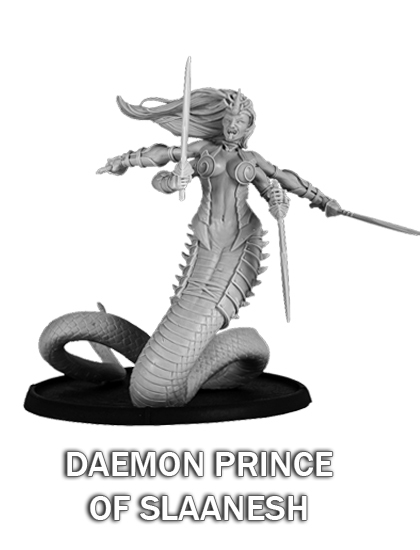 Instead I took advantage of the 25% off sale at Mierce Miniatures and ordered the Pleasure Daemon. I think this will be a great centre-piece model to have in the middle of the army. The Keeper of Secrets is going to be my only wizard for the army, I was considering the inclusion of multiple Chaos Wizards but with the rule of one now in effect it limits the effectiveness of using multiple wizards unless they all have unique spells. 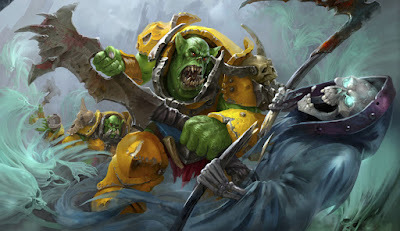 The Cacophonic Choir spell is situational at best, if I rock up against Grots or another low bravery army then doing D3 mortal wounds to every unit in 6" could be quite effective but I'm sure the Keeper of Secrets will mainly be casting Mystic Shield on either itself or another unit nearby. This will be my general and I’ll be hoping to be able to really use his command ability of allowing a unit to pile in and attack twice to great effect. If I can get a big blob of Daemonettes in and then attack twice with their two attacks per model then in theory they’re going to shred through whatever they face. The Keeper of Secrets isn’t too shabby in combat either, starting off with an initial six attacks hitting and wounding on threes with minus one rend and two damage each. It also has the grandblade that is an extra two attacks, hitting on threes, wounding on twos if at full wounds and doing minus two rend and D3 Damage. If you can get the Keeper of Secrets into combat without taking any wounds and put it up against a low armoured foe then it’s going to munch through that unit pretty easily. You could even make yourself pile in and attack twice just to make sure that unit is super dead at the end of the combat phase. 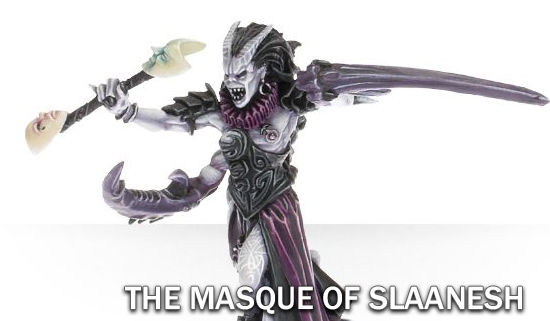 Now onto a late addition to my list in the form of The Masque of Slaanesh. I had a few points left over and it was a toss-up between either this special character or a lone Seeker Chariot of Slaanesh, and to be honest there was really only going to be one winner. At movement ten she can keep up with the rest of the fast army, the best thing is that she halves the movement of units from the opponent’s army within 12 inches. This is a great debuff bubble to really slow down your enemy, I mean Orruk Brutes go down to movement two! It’ll really help my army get the charges rather than the other way round and with the masses of mortal wounds being pushed out via the Exalted Chariots. The Masque also has two rather quirky combat abilities, one allowing you to re-roll all failed wound rolls if you have a higher movement than your opponent, and with movement ten that should be pretty easy to achieve. The other lets you roll a dice and all hit rolls of your opponent that matches that dice roll is automatically missed. Granted sometimes you’re going to roll a one and the ability will become a null point but there could be that one time you roll a six and a unit that relies on sixes for special abilities (Retributors for example) automatically miss. My Host of Slaanesh Daemons wouldn’t be represented correctly without a Daemon Prince with the mark of Slaanesh. I was going to get one of the fantastic Games Workshop plastic kits but as I was putting in my order for Mierce the Sthena, Gorgor of Khthon miniature caught my eye as an ideal Slaanesh Daemon Prince. My plan is to paint the snake part of the body to tie in with my seekers and then obviously the skin the same colour as the Daemonettes. As long as my opponent agrees, I’ll be using the faster movement rules as if the model had fly but not let the model Fly. I think the quickness of the model will tie in with the Slaanesh ethos. I really like the ability for the Mark of Slaanesh too allowing the Daemon Prince to attack before another unit that piles in within 3” of it. This means I can fight other combats knowing I can activate this ability when needed. I’m still trying to decide which weapon to equip it with but as the model has a sword I’ll probably lean more towards the Hellforged Sword. I can probably see the Daemon Prince and Keeper of Secrets teaming up and staying relatively close to each other. 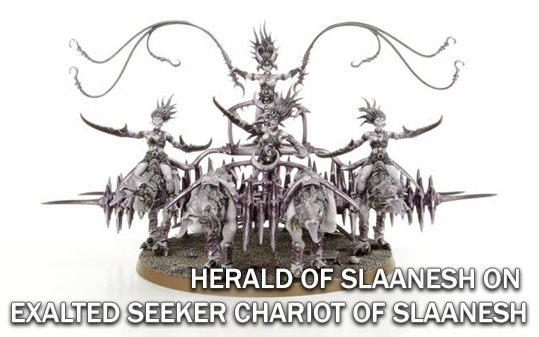 The final hero to join the Host of Slaanesh is a Herald of Slaanesh on an Exalted Seeker Chariot. With movement 12 and nine wounds I’m hoping the Chariot will be able to be ultra-aggressive from the off and cover a lot of the board straight away. The 5+ save that seems to encompass the majority of the army is difficult to ignore, however the fact the chariot doesn’t drop in effectiveness as it gets wounded then it’s not too much of a problem. The +1 to Battleshock tests for enemies within 3” is good especially as units will be losing some of their models from the sheer volume of attacks and the devastating charge. 20 attacks, 12 chances of doing another attack on a roll of a six, this chariot has a bucketload of damage potential. Only six of the attacks have rend at minus one but anyone who has ever played a wargame know if you make your opponent roll too many dice for saves they’re slowly whittle down their effectiveness. Add the fact the chariot does mortal wounds on the charge (more on this below) then the plus one to the battleshock test could be the difference between the unit being fine or running away. Much like the Herald version these are going to be brutal on the charge, I’m going to be running two in my list making a grand total of three Exalted Chariots of Slaanesh in my army. With the increase of Battleline units meaning more troops on the table these Chariots have the potential of murdering units with their charge ability. Roll a dice for every model within 1” after the charge and on a 4+ the unit suffers D3 Mortal Wounds…yes D3 so throw it into a unit of 10-20 Battleline troops and you could very easily take half the unit off just from the initial charge. Another tactic which someone on the TGA Community suggested was after the charge and combat phase you could then retreat out of combat and then hope for the double turn to charge into the unit again. 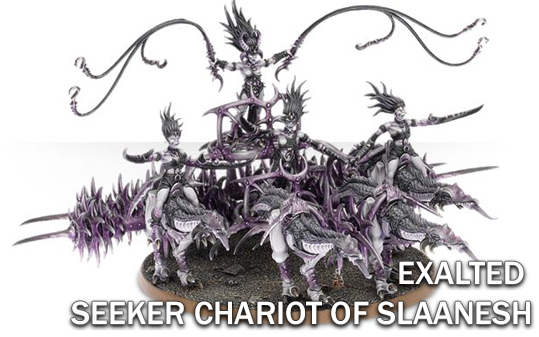 I’m hoping the speed and the volume of attacks these chariots can provide will be a thorn in the side of my opponent and having two (three if you include the Herald of Slaanesh version too) in the list will allow me to either put them on each flank to cause a pincer or I can run them next to each other to maximise the amount of mortal wounds I can inflict at once on a unit. 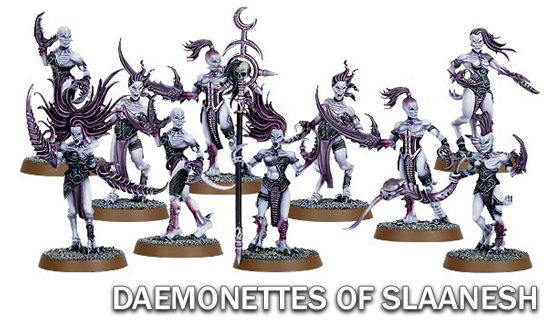 Now the bread and butter of my army, The Daemonettes of Slaanesh. These are my only Battleline unit in the army and I’ll be running 40 of these little beauties. I’m still deciding on one big blob of 40, four units of 10 or two units of 20. I need to check with the tournament organisers whether the unit sizes can be changed each game. They’ve got a six inch move and can run and charge in the same turn meaning they’ve got a potential 6”+3D6 threat range. Granted their not as fast as the rest of the army but for foot slogging troops they’re going to out manoeuvre the majority of armies on the table. Combat wise they can dish out a fair amount of damage, two attacks per a model, hitting and wounding on fours with minus one rend and one damage. Any rolls of a six will make one extra attack, changing to fives or move if there is 20 models in the unit. As mentioned couple this with the Keeper of Secrets command ability to pile in and attack twice and these Battleline troops can prove rather useful. I love the fact that enemies have to re-roll hits of a six when within six inches of a Slaanesh Daemon Hero, again much like the Keeper of Secrets this can negate a lot of the abilities that pop when you roll a six, Blightkings, Retributors, etc. Of course like most Daemonic troops you always have the option of rolling a one for your Battleshock and getting D6 models back to the unit thanks to the Icon Bearers. This is rather useful when you’ve got one wound models with a 5+ save. Now we all know Slaanesh is a rather quick force, well how does a 14” + 4D6 threat range sound? Yes Seekers are that quick. A standard 14inch move, plus a 2D6” run and then the ability to charge the same turn they run. Oh did I mention they also get +1” to their charge and run rolls when within 12 inches of a Slaanesh Daemon Hero? These guys are fast, sure they’re not the most survivable or that effective in combat; but they’ve still got two wounds each, can bring back D6 models on a Battleshock roll of a 1 and have four attacks per model with the chance of getting two extra attacks on sixes to hit. I’ve got 15 in my list again I’m not sure whether they’ll be in a unit of 15, three units of five or a ten and a five. They’re going to be harassment pieces more than anything, make an opponent panic when they’ve instantly got these in their face and hopefully that’ll allow me to react and hit with the rest of the army. Finally last but not least is the Chaos Gargant. I love Giants. They’re big. They’re imposing. And by god they look great on the table. As mentioned on previous episodes of the podcast by long term plan is a Destruction monster-mash army with gargants and the likes but for this army I had the spare points to choose one and when I saw the Mierce Talos, Kolossos of Bronze miniature I knew it was going to be finding its way into the Host of Slaanesh. I think I’ll probably try and paint him how Mierce has, obviously nowhere near the level of standard they can paint at though, and have him as a statue that has been conjured to life by a Chaos Wizard. I think the plume fits quite well in with the Daemonettes and I’m thinking painting the eyes a glowing pink will tie in against the pinks that I plan on using on the rest of the army. The Gargant is just going to do whatever it pleases, I’ve not got a plan for it as I know it can be a little unpredictable with the chance of falling over if you roll a double for the charge. I’m hoping while not as fast as the rest of the army the Gargant might take some of the focus away from the other pieces of the force and if it reaches combat then hopefully it can combine with the likes of the Daemon Prince and Keeper of Secrets to really put down some damage. So there’s the army. It’s 62 models and I’ve got about nine weeks to get it built and painted. I cannot wait to get it on the table, I think it has the potential of being ridiculously fast and rather devastating on the charge. I just hope I’ve not missed a trick or forgotten about something that makes it less synergised as I think it is. Most of all though I can’t wait to see what it looks like on the table, with the combination of the mass quantities of Daemonettes, the large exalted chariots and colossal centre pieces from Mierce Miniatures I think it’ll look great on the table, but here’s hoping I can do the paint-job justice! I've bought my ticket for the first ever Facehammer GT, the weekend event will be taking place at the newly renovated Element Games North West Gaming Centre on September 24th-25th. And this event is going to be the first 'large' event up in the North, for myself being based in Newcastle it's ideal for me to attend without having to travel six hours down the country. But I'm struggling massively on what to take to the event. With just over 9 weeks to go I'm wanting to bring a new army using the General's Handbook. I know I’ve recently purchased a lumberyard’s worth of Sylvaneth, but I don’t want to rush them through to get them on the table for this tournament. I’d rather take my time with them and get them looking as good as I can, furthermore I’m not wanting to field my Stormcast again for a tournament so soon. Don’t get me wrong I enjoy using Sigmar’s finest on the table but I want something new to learn and push about all weekend. The problem I’ve got is I keep switching between four to five different options. Flicking through the Grand Alliance books I see one force and get set on that, then the next day I flick to a different page and suddenly want to field that. It’s safe to say I’m settled on either using the Grand Alliance Chaos or Destruction, but again I cannot seem to commit to one or the other. So what are my options I'm chopping and changing from? I’ve always wanted to do a Khorne army, I love the Blood for the Blood God, Skulls for the Skull Throne mantra and quite enjoy a very combat-focused army. I’ve already got the Bloodbound half of the starter set and with the Start Collecting Daemons of Khorne I can very easily expand the army outwards. 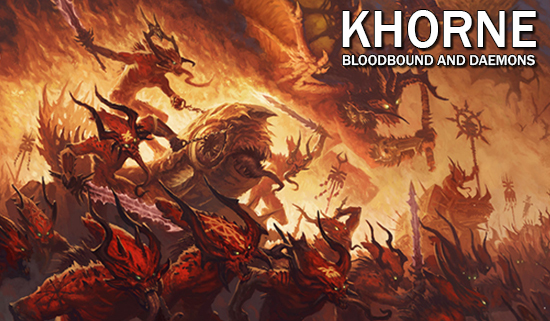 I quite enjoy the idea of a couple of Bloodthirsters (maybe Skarbrand) taking centre stage on the table, backed up by waves of Bloodletters, Flesh Hounds and Bloodcrushers. 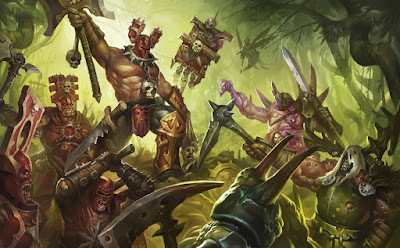 I think for the Bloodbound aspect of the army I’d focus on the Khorne Buffing Heroes that they have and maybe include the Might Lord of Khorne, because let’s be honest for a moment; having a Lord who can tear through reality and take anything off the board if you roll lucky…What’s not to like? Next up on the Chaos front was an army solely of Warherd. In the General’s handbook Bullgors become battleline troops if you run a Warherd army so my idea was lots of minotaur Bullgors, backed up by a couple of Doombull heroes and then two each of the Cygors and Ghorgons. On the table I think aesthetically it would be a big looming army to play with and really makes the opponent think twice about running straight into it. 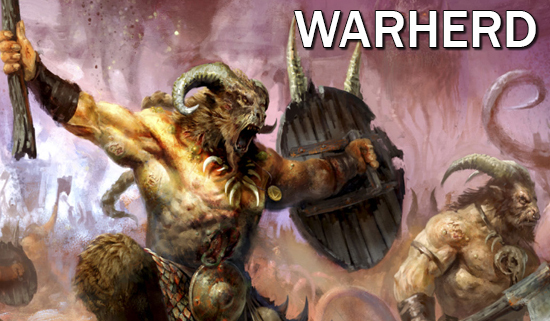 The warscrolls for the Warherd aren’t the greatest out there but I know I’d think twice about engaging that army if I faced off against it on the other side of the table. My one stumbling block I have is the Games Workshop Bullgors, I saw some of these in my local store the other night and it’s really put me off, they look so cartoonish. 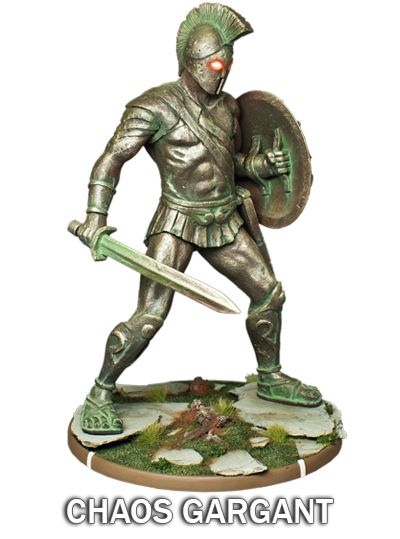 Unfortunately there’s not another company out there that does enough variety for Bullgors, I love the Mierce Miniatures Minotaurs but again the variety in poses are limiting and trying to do a full army of them could prove difficult. Talking of Mierce, the Pleasure Daemon that they have just released is the one reason I really want to do a Host of Slaanesh army. Overall this is one of the fastest armies in Age of Sigmar with a lot of the units being able to run and charge in the same turn. My stumbling block for these is that I really want to include a few chariots as the main bulk of the force but with just nine weeks to go before the tournament I’m not sure whether I force myself to build and paint up all of the chariots I’d need. This army is definitely a high contender but if I do decide to run this army I’m going to have to get a shift on in making sure I’ve got enough time to build and paint the chariots above everything else. 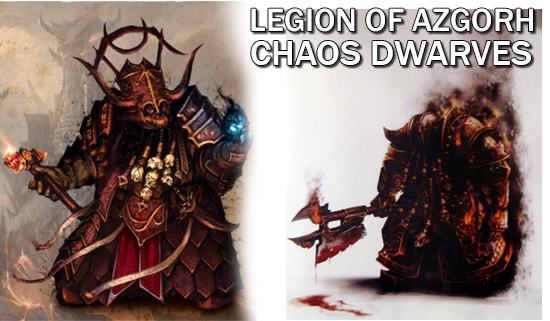 Finally for Chaos, my long term goal is to have a Legion of Azgorh Chaos Dwarf army from Forgeworld. Seeing Ben Curry’s army from the Bad Dice Podcast the models look great, including some stunning centrepieces along with a mix of war machines and troops. 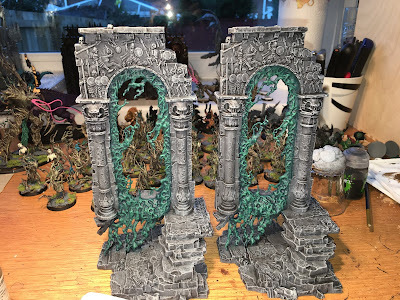 Obviously there is two hurdles I’d need to overcome with this…the first is painting up an army with a lot of troops and big things, as long as I have a deadline to work to that shouldn’t be too much of a problem. However with a Forgeworld army I really want to take my time to making them look as great as I can. I painted up a 30K Death Guard army in about three weeks a couple of months back and while it looks good for the money I spent I would’ve rather have taken the time to make it look better. That goes onto hurdle number two, cost. Having to buy a full Forgeworld army at once is a massive expense. I can afford it but it would cost a good couple of months worth of hobby budget to fund it. Down the line I'll definitely be bringing the Legion of Azgorh to a table but I think that this army will be a buy piece by piece deal. Moving onto Destruction, I was oh so close of jumping on the Ironjawz bandwagon when they first released. 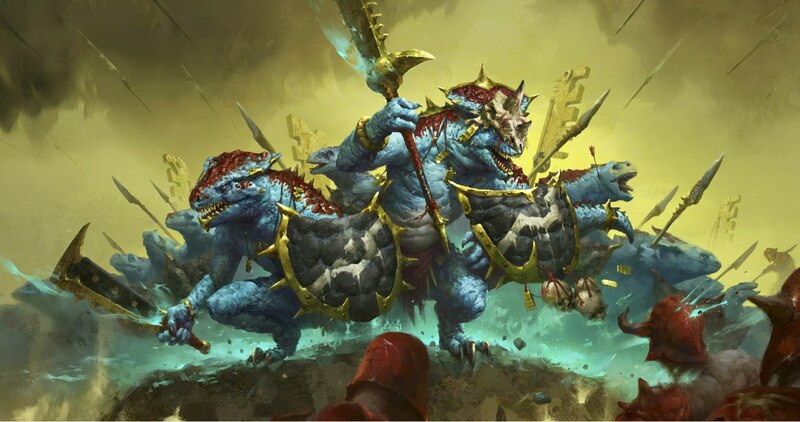 I remember seeing Twitter ablaze of people buying the new Orruks as their new army but for some reason I held off. Looking at the points in the General's Handbook I can have a rather low-model count army at 2,000pts that still hits pretty hard. Goddrak would lead the line (obviously) but he would be backed up by Goregruntas, Brutes, a Weirdnob Shaman and a handful of Ardboyz. 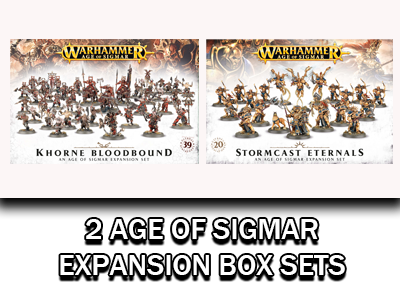 With the imminent release of the Get Started Ironjawz the core of my army can be filled using these new boxes. There's just something which keeps making me hesistate yet I cannot seem to put my finger on it. I've read through the Ironjawz Battletome and really love the fluff along with the different colour schemes, but I'm still not sure. I think Goddrak could be a beast for the army but he does sink up ALOT of points in a 2K game. 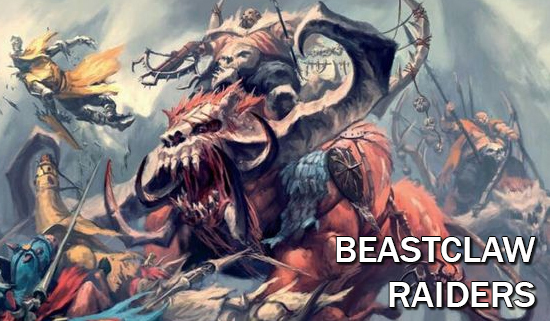 Last but not least is the upcoming release of the big furry Beastclaw Raiders. Stonehorns and Thundertusks, no not an album name for a metal band, but Ogors riding big beasties backed up by Mournfang Cavalry and Sabertusks. 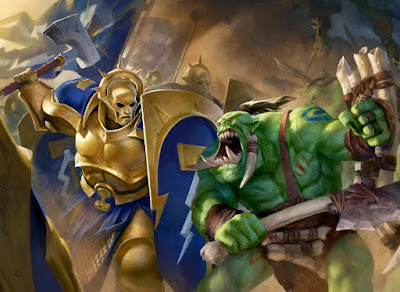 The army is going to be coming out with it's own Battletome in the coming weeks and will be sure to be one tough army to crack. The iteration of this army has already been seen on the tournament scene since Age of Sigmar dropped and it's been deemed very tough to play against. The monsters are either rock hard to kill or deal mortal wounds like they're going out of fashion. I think the army could very well be the smallest in model count so getting it ready in nine weeks would be no problem at all. Honestly though I'm not too sure how fun the army would be for both myself and my opponents when the army does what it does. I suppose it depends whether the Battletome adds any new flavour to the army and maybe introduces a Spell Lore and Artifacts that make the army play completely different. I suppose I'll have to wait until whenever the Battletome is released, and if I do that, it means even less weeks to get the army ready for Facehammer GT. So what should I take? Got any other suggestions for a different army? Let me know in the comments below. 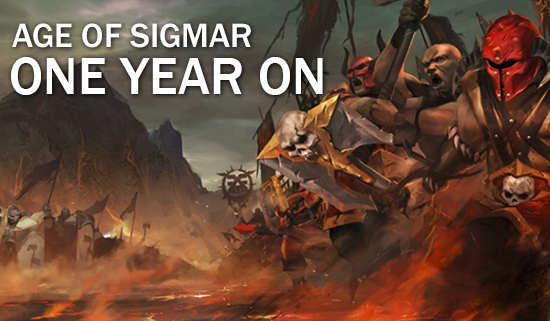 It’s been just over a year since the drastic change of direction of Warhammer Fantasy by Games Workshop with the release of Age of Sigmar (AoS). After the culmination of The End Times, The Old World, or The World That Was as it’s known in AoS was no more. Now the eight realms are the focus as Grand Alliances of, Order, Chaos, Destruction and Death battle for supremacy. So with a year gone since players started battling over the mortal realms I thought it would be good to have a look at the previous 12 months and see the State of Play for AoS. This isn’t going to be a really in-depth look but brief overviews and my rambling thoughts of the game and the direction it’s heading. 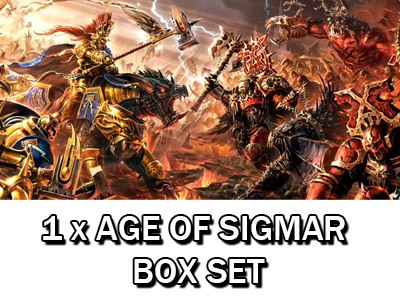 I know I’m not the only one who’s felt this, but it’s felt like the past 12 months has been non-stop continuous releases for AoS, I’m sure 40K players will agree that the majority of weekly White Dwarfs this past year have had Age of Sigmar releases. Having White Dwarf weekly has definitely kept the rate of releases and news constant and believe me I’m not complaining at all…well apart from not having the time to get/read everything! So what has been released in the last year? Deep Breath…. Yeah so quite a bit, I’ve probably missed a whole batch of things but as you can see GW has been completely committed to creating a brand new world and story straight away. They could’ve easily given players the box set and then drip-fed them lore and new armies every other month while also supporting 40K, but with such a change it’s obvious they knew they needed to keep the releases constant and substantial as the game kicked off. There is no denying Stormcast Eternals have been the focal point for AoS since the game launched. A brand new force which drew a lot of divided opinion when they were first revealed, many a wargamer dubbed them Sigmarines, and yep I’ll even admit I did at first. I mean they did resemble big bulking armoured good-guys; initially these seemed like GW took Space Marines and threw them into the Fantasy environment, but as the weeks rolled on and we got a more diverse selection of characters and units then the comparisons soon dwindled, well apart from the AoS haters who like to make sure everyone knows they still don’t like the game. But we’ll just ignore them! The miniatures are great for modellers, the big open armoured panels give new players a great starting place to learn how to paint, while there is enough detail to really give veteran painters the ability to create some stunning paint jobs. You can spend as much or as little time painting these up and still have an army that looks really great on the table, hell I painted up a whole army over the course of 3-4 weeks and felt like I did them justice. By creating this new faction in the form of the Stormcast, GW have given themselves the opportunity to expand outwards from the faction with different Chambers. We’ve already seen the Extremis Chamber which followed a few months later from the initial release and brought big bulking Dracoth cavalry and the stunning Stormdrake Dragons. In the Stormcast Battletome there is mention of numerous Chambers which haven’t been touched on yet, the Extremis was the first, but there were at least another three. I think next year, and this is me just purely speculating at the moment, we might see another Chamber maybe around the same time as the next batch of books are released following on from the Realmgate wars. We’ve seen some great battletomes in the past year, a brand new faction of Duardin Fyreslayers came out with a whole range of new models, though I’ll not be the first to say that I feel GW missed a chance with Fyreslayers. Throughout the book and the novels the Slayers are described as mercenaries who will work for anyone as long as the ur-gold is flowing, there’s even a moment in one of the novels where the Fyreslayers turn on the Stormcast because Chaos offer them more ur-gold. Though in the battletome and their keywords they’re solidly aligned to the Grand Alliance Order. GW could’ve definitely done something very cool and allow the Fyreslayers to either run as their own army or be a part of any Grand Alliance. I’m sure any general would’ve like the idea of running some mercenary Fyreslayers along with their main army. Seraphon was another release which suffered from being one of the first books released. No new models came with the launch, and the rules in the battletome quickly made the Seraphon very tough to play against. 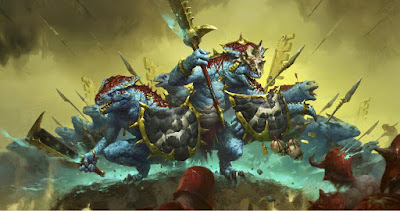 Everyone in the tournament scene knows the joys that Lord Kroak, Bastialadons, Temple Guard, Ripperdactyls, bring to the table… rather than having one punchy unit that defined the army, the Seraphon were max out to difficulty 10. And you have to feel sorry if you’re running Chaos Daemons against that army, they suffer more on the board against them than anyone. By all means they’re not impossible to defeat but they are a rock hard army. 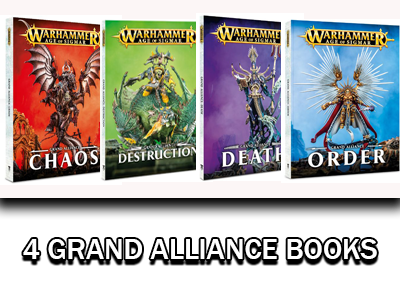 The best thing that GW did though was the release of the Grand Alliance books. These covered all of the different factions in each Alliance giving snippets of what new factions we can expect to see down the line, and best of all they were released at a really affordable price point. 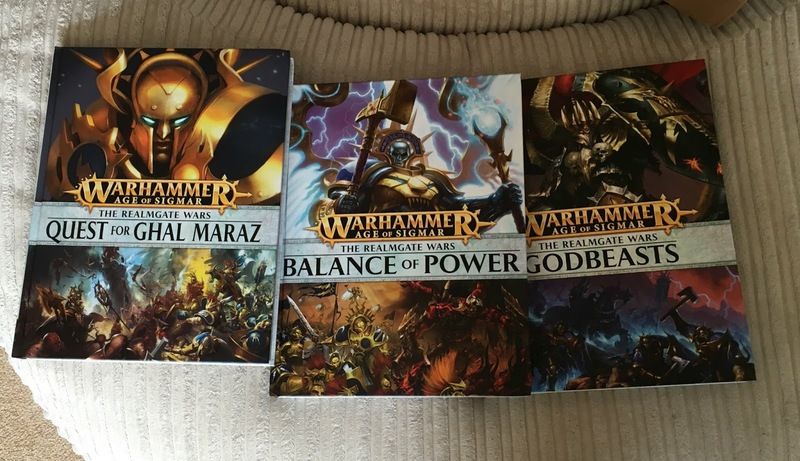 The Order and Chaos books were amazing value for money and are full to the brim of full colour warscrolls. 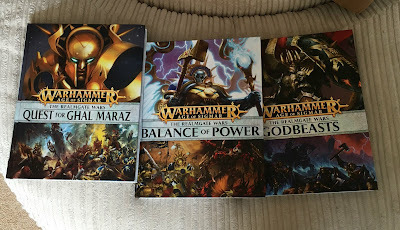 If you’ve not got them all yet I whole heartedly recommend them, even if it’s just to have them as big catalogues of the different models from Age of Sigmar. I constantly find myself picking one of them up and instantly my hobby juices start flowing as I look at different factions and look at the different synergies available if I pick units X, Y and Z. 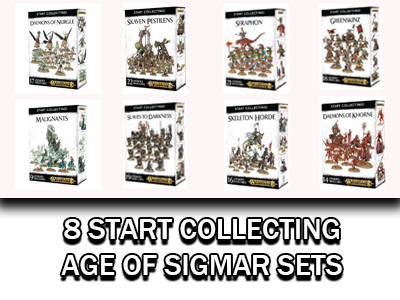 Talking of Synergies, it’s one of the great features that encompasses Age of Sigmar. Sure you can play an army of lots of different units across a Grand Alliance but if they don’t have those Keywords that work together you’re not going to be getting the buffs and bonuses AoS thrives upon. For example when you look at the different Khorne units and heroes with the extra movement and attacks they can stack across the army, it’s phenomenal and can easily make units charge on their first turn. Likewise the Stormcast have numerous heroes and units that can buff and support each other in ways that a Stormcast hero and Freeguild unit couldn’t in the same situation. It opens up the joys of list-building for your army, giving you that decision of either having a mixed arms force or tailoring your army to do one specific thing as long as all your abilities and spells go off correctly. Games Workshop has made a great start of re-imagining current models as their own sub-factions. As mentioned the Grand Alliance books takes whole armies and splits them down into smaller factions, a teaser as you may, of future releases. The Flesh-Eater courts from the Death book was an amazing example of this and was an tremendous release, there were no new models, bar a kitbashed unit of current models, but used all the Ghouls, Crypt Horrors, Ghoul Kings and the Terrorghiests and made them their own army. The battletome gave the force their own intriguing lore explaining how they see themselves as a Royal Court and instantly gave this faction a brand new lease of life. The synergies between all of the Flesh-Eater Courts such as giving them extra attacks, re-rolls to hits and wounds, among other bonuses really allows the player to just play that mono force. 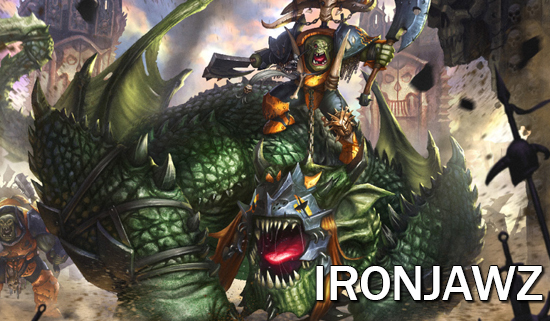 The Ironjawz was another release that got a lot of people excited, so much so that Twitter was full of everyone pre-ordering these miniatures. These new Orruks, got a whole range of new models including a big centrepiece dragon model, nicknamed by many as the grumpy cabbage. It was the first release that genuinely seemed like everyone wanted to pick up and play. Again Games Workshop repacked the old Black Orcs as Ardboyz and made them the not so small ‘grunts’ of this army. I’ve played a few of these Ironjawz forces on the table and they’re stunning to look at, big imposing Orruks with mammoth sized boars and that massive Maw-Crusha. 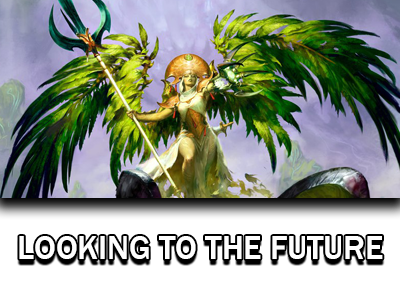 It’s a stunning new army on its own or a great addition for current Destruction players. 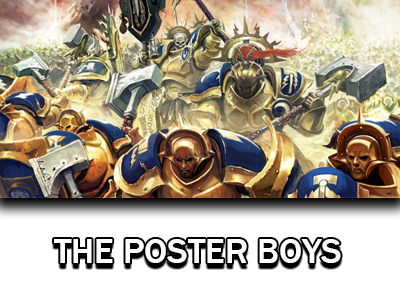 The most exciting thing in the past year is the current Summer Campaign that Games Workshop is running. 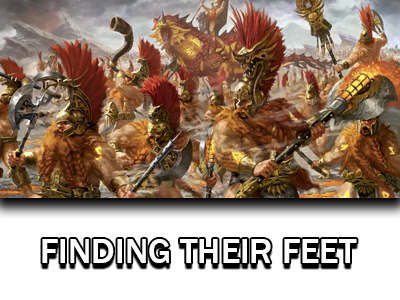 Players can submit their battle reports, painting jobs and more to affect a global campaign that will purposely shape the future of the Age of Sigmar storyline. Specific battleplans are being released for the campaign which I think is going to be great to see how the battle gets more in-depth the further we go into the campaign. This is a tremendous way to get players involved and make them feel a part of the story; feeling like they have a chance of making their faction or Grand Alliance a much more prominent role in the future of the game. 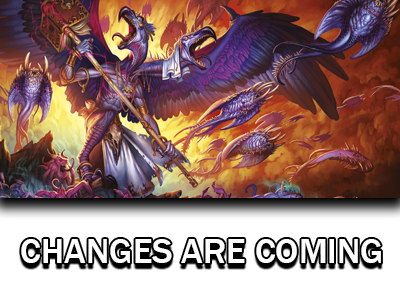 With the campaign only affecting the Realm of Life, I hope this will be the first of many campaigns as more of the realms are properly unveiled and focused on in the future. It seems like the future of Age of Sigmar, gameplay wise at-least, is already beginning to take shape. Games Workshop is about to release the General’s Handbook on the 23rd July. This book with over 160 pages in, will give players many different ways to play, including the main thing that a lot of people complained about when the game first released….points. Yes ‘Matched Play’ as it’s being dubbed is being released to give players a much stricter way of playing the game and introducing a competitive aspect of the game to be used in conjunction with tournaments. 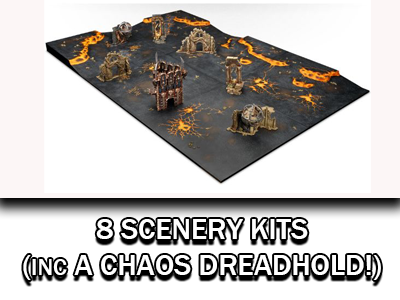 They’ve worked with the guys from the Age of Sigmar South Coast Grand Tournament (Dan Heelan, Wayne Kemp, Russ Veal) and Bad Dice Podcast Ben Curry to produce something that can be used in tourneys in the future. It’s good GW has listened to the feedback from people about wanting points back in the game but for me it’s neither here nor there. The tournament scene has already got its own ‘points’ system that works really well and at the moment is constantly updated as new factions are introduced; my fear is now GW is publishing points these current systems are going to become redundant and we’re not going to be having as constantly updated points cost of units like we’ve had in the past; this can potentially result in certain powerful units which might’ve been under-costed being the go-to units each and every time meaning the ‘net-list’ creep for factions could return again. Realistically it’ll probably be down to tournament organisers to make changes where needed and the General’s handbook does encourage house rules, they’re dubbing the Matched Play as a guidelines rather than the letter of the law. I also hope tournaments do not use the force organisation chart, for me the joys of the tournaments since Age of Sigmar was released is seeing the quirky and unique lists, Ben Johnson’s 5 Stardrakes at SCGT for example. I’ve mentioned it on the podcast but I really want to do a Troll Hag, 5 Giants and River Trolls for Blood and Glory in November, it’s a crazy army that won’t really be that competitive but all of those big things running forward would be a great sight on the table, but with this new army build structure the whole list is illegal and unusable. But enough about Matched Play, the section of the General’s handbook that I’m really looking forward to is the narrative play. The ability to have a set structure of playing out a campaign is something that really appeals to me. I like the fact there are numerous different types of campaigns you can play too, rather than just being given one way and that’s it. The one which really grabs me at the moment, again this is purely from the leaks, is Path to Glory where you start with a leader and a small warband and grow your force over time into a massive army, gaining bonuses and items along the way. If it works as well as it looks like it does then it's going to be great to play with friends at a club or at home where you all battle to become to the biggest general there is. I know me and a friend are planning a campaign when the book drops and we’ll be recording our progress on here for everyone to see as our generals become bigger and more powerful. Outside of the General’s Handbook it’s the newly released Sylvaneth Battletome, which has got a lot of attention from the Age of Sigmar community. 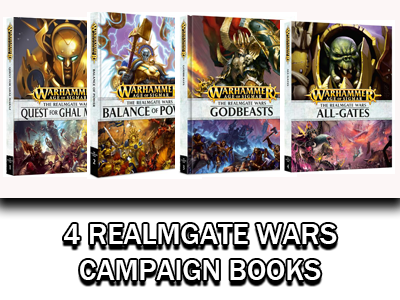 Games Workshop has added so many new features into this book it really shows the change of direction of where AoS is heading. Returning for the first time is special specific magic lores for Sylvaneth wizards, artefacts (magic items) to equip to your heroes and also arcane items for your wizards. Along with these we also see Allegiance and Command Abilities where you only get these features for fielding an army solely of Sylvaneth keyword models. Again you’ve still got the option of mixing and matching across the Grand Alliance but these extra rules and abilities are really rewarding players for sticking to one faction. 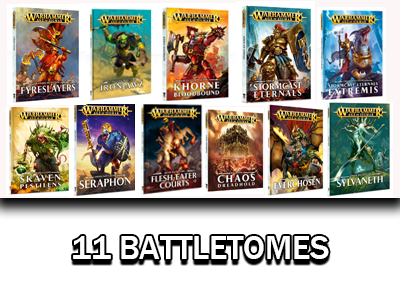 Hopefully all future Battletomes will also be featuring these to give each faction their own distinctive flavour, we talked about it on the podcast on Episode 3, but imagine a Moonclan Grot Battletome where they have crazy big spells that can dish out lots of mortal wounds but also damage yourself at the same time. I’m really interested to see how the new Bonesplitterz Battletome (Savage Orruks), which is rumoured to be up for pre-order on Saturday, lines up and whether we see as much depth with abilities and items as what the Sylvaneth received this month. So what else can we expect to see in the upcoming future? Well a brand new Realm of Battleboard has been teased for months now, it was first seen in Warhammer Visions back in April saying Coming Soon but we’ve yet to see it released. I love my current Realm of Battleboard but it is very much set for the old world. However from the grainy pics I’ve seen so far of the new board it’s going to be a great setting for AoS and hopefully we’ll see some more terrain pieces released to expand on the first batch we received when the game was released. 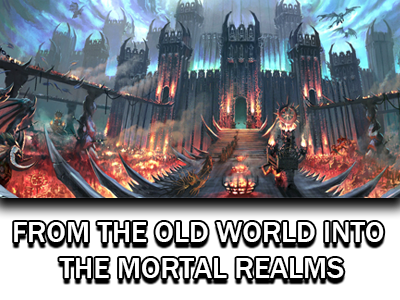 Now the Realmgate Wars are over, what war in the Mortal Realms begins now? 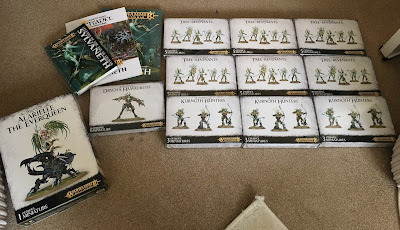 So after being disappointed by Royal Fail's delivery attempt on Saturday (they just didn't turn up), my Sylvaneth have arrived yesterday and my god these kits are beautiful. As mentioned on Episode 4 of the Podcast this is going to be my main focus for 2016, adding to the Treelords and Dryads I've already got painted up. Out of shot I've also got the Branchwych that I built last night (what a fiddly model! ), along with the Sylvaneth Dice, because let's face it when there's wooden dice to tie in with your tree army you're going to be rolling them....even if the symbols are on the 1s. So what exactly did I pick up for release day? 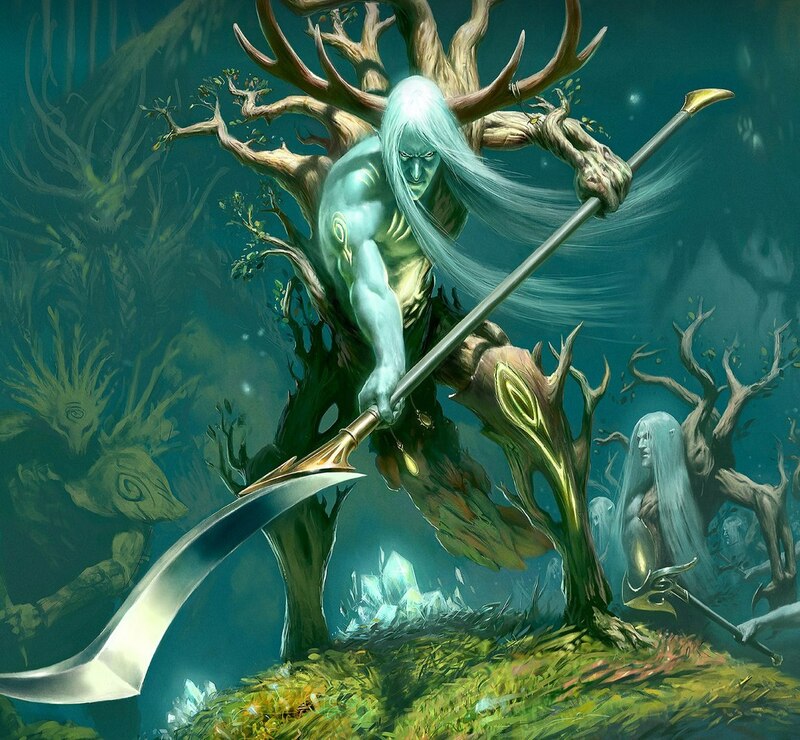 I'm pouring through the Sylvaneth Battletome at the moment and will be producing a multi-part in-depth review on here, going through each unit and talking about the unit's strengths and weaknesses. 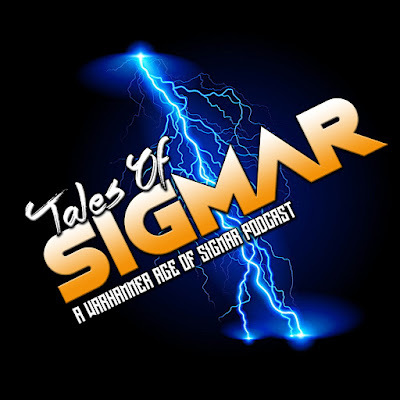 Welcome to our hobby heavy 4th episode of a Tales of Sigmar podcast. We're back to full strength tonight as we cover the recent releases, talk the General's Handbook and give updates of our hobby progress. Welcome to Episode 3 of the Tales of Sigmar podcast. In this Age of Sigmar event-special episode we're a man down as Adam couldn't make it due to real life issues. 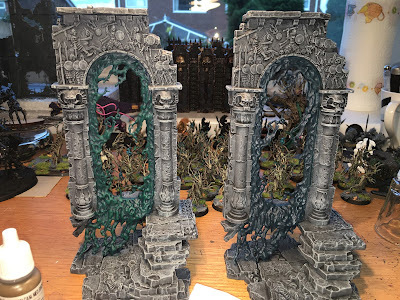 So instead Chalmers recaps his one day tournament at Leeds Last Stand, while Dan covers the Call to War weekend event in Bristol. 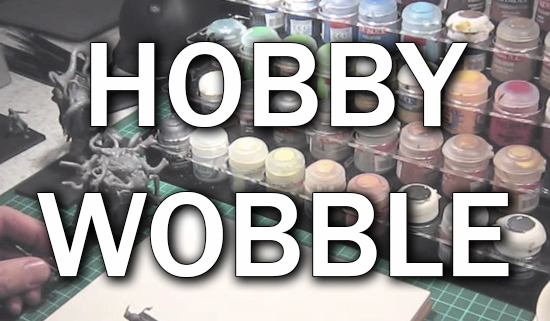 You're in for a treat this week, stay tuned this weekend for a hobby-centric Episode 4 with the whole team. What's a better way to start the weekend than having two episodes of Tales of Sigmar for you to listen. 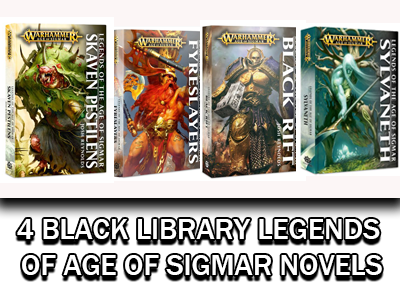 So I thought I'd finally catch up on all the Age of Sigmar lore that's currently out there....yeah there is a lot! 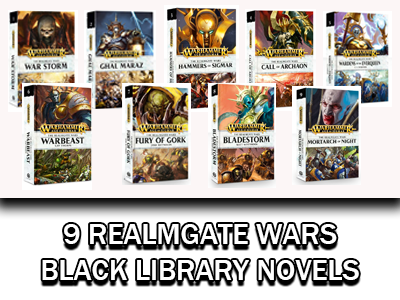 Black Library have absolutely knocked it out of the park with a constant stream of novels, audio dramas and novellas, I have a feeling I'm going to be spending quite a bit on the site over the next couple of months. 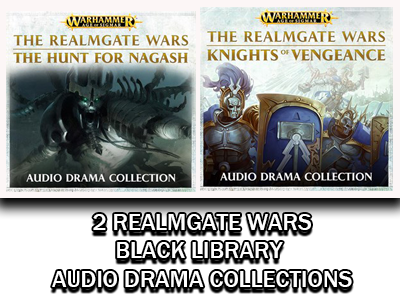 With the Realmgate Wars coming to a close with Book 4 - All-Gates, which is released this Saturday, I thought the best course of action was to pick up books 1-3, Quest For Ghal Maraz, Balance of Power and Godbeasts and read through them in the next week or so. I've had a quick flick through and the books are stunning, loads of battleplans which are definitely going to played at some point, batallions and also lots of hobby goodness including painting guides. I'm not going to go back and review these, there is enough blogs and podcasts out there who have reviewed them already and feel it's a bit redundant doing the reviews of books that have been out for months now. 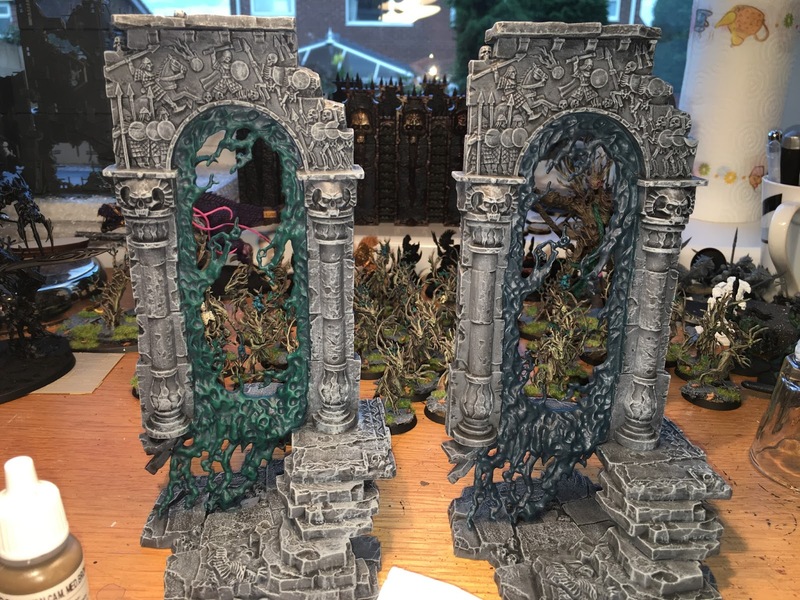 So ahead of Sunday's game, I thought I'd get my Realmgates that I purchased on Thursday speed-painted and tabletop ready. I knew I wouldn't have them completely finished for Sunday but if I could get the basics down and painted up then going back to them at a later date would be easy enough to finish painting them up. I started by doing what I do with every bit of scenery I own, spray the kit in black undercoat. I use Halfords primer, they do big cans, it's pretty cheap and the coverage is great. I've never had a problem with any of the primers I've bought from them. Leaving the primer to dry for 24 hours, I then gave the whole of the realmgate minus the middle part a basecoat of Games Workshop Mechanicus Standard Grey. After that it's a liberal coat of Nuln Oil wash, this can be rather messy and be prepared to get your fingers covered in it too! Take care not to have the wash pool up on the ledges of the realmgate, I left it to start drying for a few minutes before then going back over with a clean brush and cleaning up the pools of wash that had accumilated. After the Nuln Oil has dried it gave the Realmgates a lot of depth in the recceses. The gates have lots of little bits of detail and this makes them stand out a bit, when I get to go back I can see exactly the parts I need to pick up and paint. A heavy drybrush Administratum Grey all over the model, the drybrush will pick up all the edges of the model and believe me with the Realmgates that's alot! I then wanted to tie in the Realmgate portals with the rest of my armies so gave them a basecoat of Incubi Darkness. 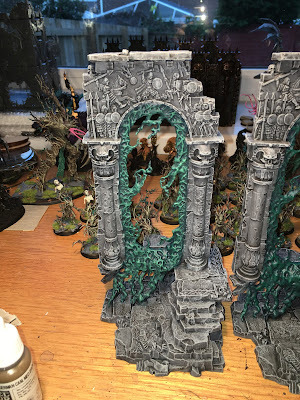 After that I did a heavy overbrush of Kabalite Green over the top leaving the Incubi Darkness in the reccesses of the portal, overbrushing is the same technique of drybrushing but the brush is damp so the paint flows a lot easier and you don't need to 'scrub' like you do drybrushing. These models are really well suited for drybrushes and overbrushing as it has alot of raised edges so it's very easy to pick out the different depths. Once the Kabalite Green has dried its a very light drybrush of Sybarite Green on the highest points just to add even more definition to the portal. This is exactly the same technique I've used on the Stormcast and the Sylvaneth and it really works well together. I did consider changing the colours of each portal but wanted it to tie in together. I'll probably get another couple at some point and do them in different colours to fit different realms/armies. This was all I did for the tabletop standard on Sunday. I want to go back and paint up the symbols and the battle scene either side at the top of the gates. I've also got a plan of adding static grass and dead leaves onto the basing and the steps much like the Sylvaneth and Stormcast, again just tying everything in together. 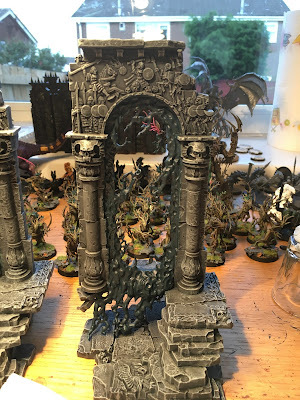 I would definitely recommend the Realmgates, they're simple to assemble (though a bit warped but easily fixable) and extremely simple to paint up.